? UNITED NATIONS, April 3, 2012 (IPS) – Which is more important in human life: money or happiness? Can money buy happiness? According to the tiny Himalayan nation of Bhutan, the time has come for the world to pay closer attention to this age-old question. “We are starting a global movement on this issue,” Jigme Thinley, the prime minister of Bhutan, told IPS after a high-level meeting on “Happiness and Well-being: Defining a New Economic Paradigm” held at United Nations (U.N.) headquarters in New York on Monday. Thinley said he wants the international community to realise that a paradigm shift in addressing the issue of sustainability in both the environment and global development is urgently needed. The prime minister explained that in his country, “gross national happiness” is a development paradigm that has guided its development for several decades. He said hoped the world community would embrace that model. That concept implies that sustainable development should not depend solely on economic aspects of wellbeing as it addresses the notion of progress. 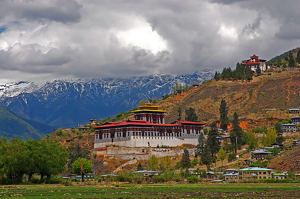 Since then, the idea of GNH has influenced Bhutan’s economic and social policy and also captured the imagination of others far beyond its borders. According to Bhutanese officials, their country has created a system of measurement that would not only be useful for policymaking but would also create policy incentives for the government, non-governmental organisations and businesses to increase GNH. The GNH index incorporates traditional areas of socio-economic concern, such as living standards, health and education, as well as less traditional aspects of culture and psychological wellbeing. “It is a holistic reflection of the general wellbeing of the Bhutanese population rather than a subjective psychological ranking of ‘happiness’ alone,” said Thinley. Bhutan has developed nine domains ? psychological wellbeing, health, education, time use, cultural diversity and resilience, good governance, community vitality, ecological diversity and resilience, and living standards ? that help measure GNH. So what kind of results does the GNH index give? According to the 2010 GNH index, 41 percent of Bhutanese qualified as “happy”. The remaining 59 percent ranged from “narrowly happy” to “unhappy”, with 47.8 of the totally population characterised as “narrowly happy”. Happy people have sufficiency in six out of the nine domains. “Deeply happy” people ? about eight percent ? enjoyed sufficiency in seven or more of the nine domains, officials said. Bhutanese officials debunked this myth, however. “The objectives of Bhutan, and the Buddhist understandings of happiness, are much broader than those that are referred to as ‘happiness’ in the Western literature,” they said in a press note. In 2011, the U.N. unanimously adopted a General Assembly resolution, introduced by Bhutan with support from 68 member states, calling for a “holistic approach to development” aimed at promoting sustainable happiness and wellbeing. This week, the high-level meeting on “Happiness and Wellbeing” brought together world leaders, development experts and civil society representatives to develop a new economic paradigm based on sustainability and wellbeing. Gross national product, or GNP, is often contrasted with Gross Domestic Product (GDP). While GNP measures the output generated by a country’s enterprises (whether physically located domestically or abroad) GDP measures the total output produced within a country’s borders – whether produced by that country’s own firms or not, according to the government of Bhutan. When a country’s capital or labour resources are employed outside its borders, or when a foreign firm is operating in its territory, GDP and GNP can produce different amounts of total output. In 2009, for instance, the United States estimated its GDP at 14.119 trillion dollars, and its GNP at 14.265 trillion. “We should not be deprived of happiness. We have oceans of tears in this world. This model of development is not sustainable,” added Alexander Likhotal from Russia. The chairperson of the meeting on happiness, Helen Clark, former prime minister of New Zealand, urged the U.N. to provide a platform for success stories about how to measure global advancement in sustainable development. The prime minister of Bhutan told IPS that he attend a U.N. summit on sustainable development, commonly called the Rio+20 summit, in Rio de Janeiro in June. There, he said, he would urge policymakers to consider Bhutan’s idea about happiness.